Automotive Data Systems (ADS) announced Monday the release of Car Tell Auction Prices, a new iPhone app that shows users what car dealers have paid when buying used cars. The app allows you to browse through some 60,000 records over the last 30 days, and the company said that information covers all car makes. The app is aimed at consumers wanting to negotiate with car dealers when trading in their used cars or looking to purchase a used car from a dealership. 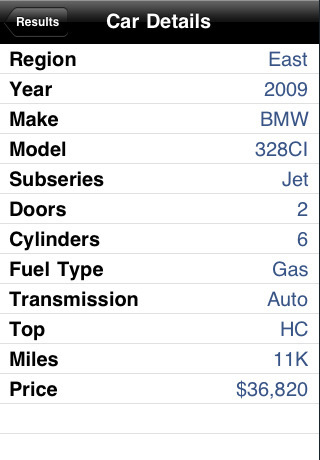 The app separates data into East Coast, Midwest, and West Coast regions for the U.S., and users can sort information by year make, model, and price, and then drill down to find mileage ranges for specific makes and models. The app is priced at US$9.99, and works on iPhone, iPad, and iPod touch, though it works in compatibility mode on iPad.